Deciding Yuki needs a familiar for her role, Haruhi picks up a stray cat and names it Shamisen. However, when Haruhi leaves that day, Shamisen starts talking as a result of Haruhi's powers. Itsuki suggests that they need to remind Haruhi her movie is a work of fiction, before reality takes any more damage. 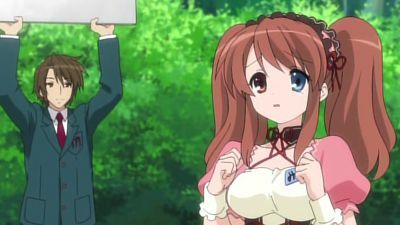 The next day at school, Mikuru gives him a coupon for her class's yakisoba café, and gives her views on Haruhi that she couldn't say in front of Itsuki. Kyon later talks with Yuki, who throws up the idea that one of them, including herself, may be lying. As shooting resumes, Haruhi's powers to continue to make Mikuru a deadly weapon. Itsuki calls Kyon out later that night, asking him to find a way to hold back Haruhi's powers. 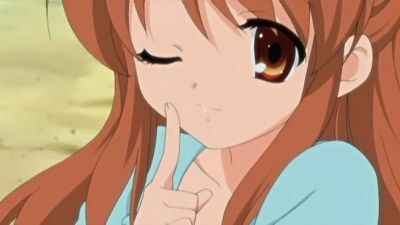 Kyon convinces Haruhi to add a disclaimer at the end, saying the film is a work of fiction, and the rest of the shooting goes without a hitch. Kyon falls asleep whilst editing the movie, only to find it has edited itself overnight. 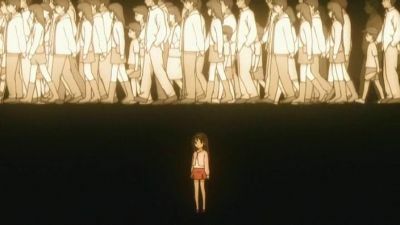 At the very last of this episode, there is a flashback to May that Kyon tries telling Haruhi that Yuki, Mikuru and Itsuki are actually aliens, time travelers and espers, but she doesn't believe him. 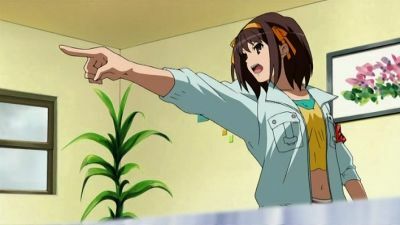 Haruhi enlists the help of Kyon to attempt to investigate what happened to Ryoko, as Haruhi believes it strange that she would transfer without notice. After a fruitless search, Haruhi tells Kyon about her earlier years, and how she changed from an ordinary girl into her present state. Later that day, Itsuki tells Kyon his organization's theories about Haruhi, and shows him some of his powers within a sealed reality. Yuki completes her explanation of the Integrated Data Entity and how it relates to herself and to Haruhi. 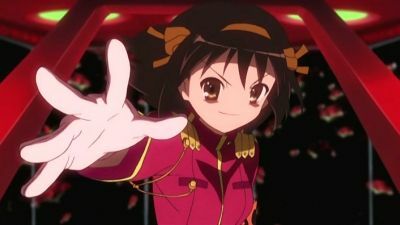 Furthermore, she discusses Haruhi's powers, and how she could destroy and recreate the world on a whim. Kyon, while simply trying to understand all of what Yuki had told him, is initially skeptical of her story. 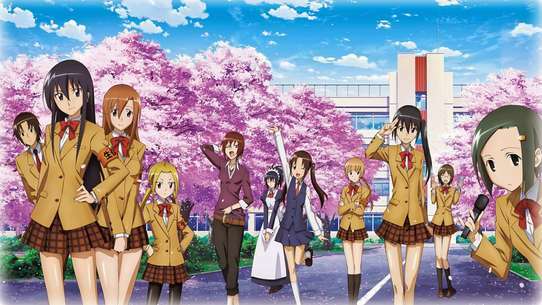 The SOS Brigade gets a new member — a mysterious transfer student by the name of Itsuki Koizumi. 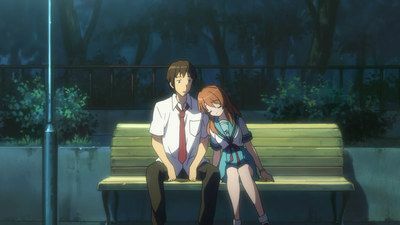 On a day off from school, the SOS Brigade searches the city in groups to try to investigate mysteries, during which Mikuru reveals to Kyon the existence of time-travelers. Kyon later confronts Itsuki and learns of the Agency. The future Mikuru tells Kyon where to find a certain person that he is supposed to help. Kyon and Mikuru travels back in time to the Tanabata of three years ago. Carrying the sleeping Mikuru, Kyon finds the young Haruhi herself from middle school. After helping her draw strange drawings on her school yard, Haruhi questions him on the existence o aliens, time travelers, espers, or sliders; and Kyon suggests that they might. After Haruhi leaves, Kyon wakes up Mikuru and finds that she has somehow lost her time traveling device, or TPDD. 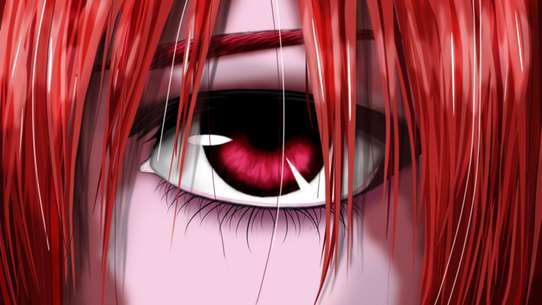 He takes her to the Yuki of three years ago and helps them return to their proper time. Chronologically this episode takes place after The Boredom of Suzumiya Haruhi. 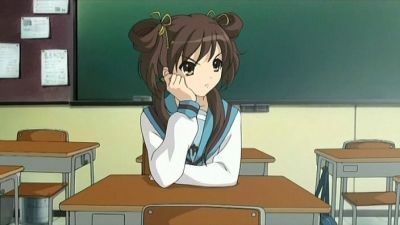 Haruhi is visibly bored and is not her usual energetic self. 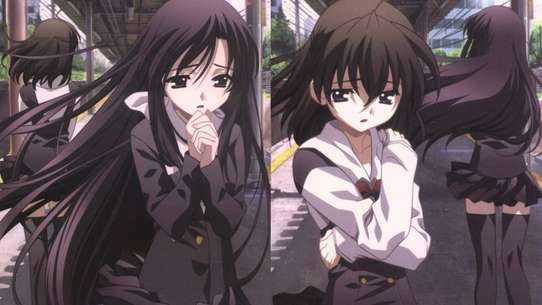 Ryōko Asakura, the class president, is concerned and asks Kyon to help her. Kyon later finds a mysterious letter in his locker, which directs to come to a classroom, where Ryōko confronts him. 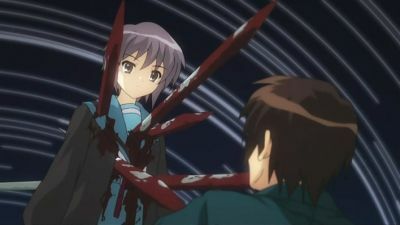 Ryōko attempts to kill Kyon, but is stopped by Yuki. Later, Kyon meets Mikuru's older self that had traveled from the future, who reveals a clue essential to his future: Snow White. Haruhi has once again become bored. In an effort to alleviate some of this stagnation, Haruhi enters the SOS Brigade into a baseball tournament. 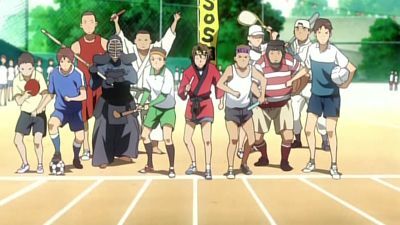 Due to a lack of players, Tsuruya, Taniguchi, Kunikida, and Kyon's sister are recruited into the team. However, the team is hopelessly inept, and if they lose, Haruhi might destroy the world. To remedy the situation, Yuki uses her powers to alter the game. On the day of the school's cultural festival, the members of the SOS Brigade are involved in different activities. 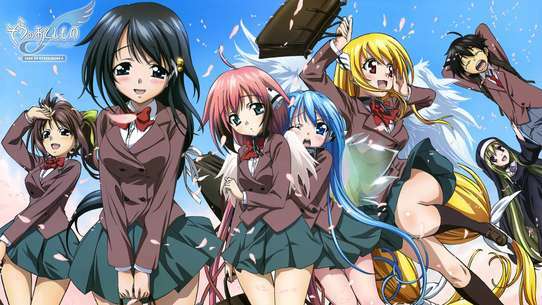 Mikuru and her class open a fried noodles café, Yuki attempts fortune telling, and Itsuki is in a play. Kyon attempts to enjoy a normal day. Kyon goes to the auditorium, where bands are playing for the audience, and falls asleep. 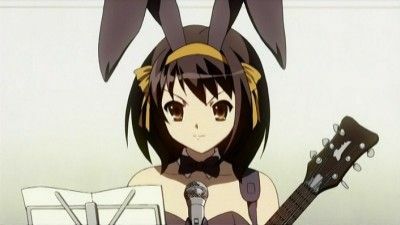 When he awakens, he sees Haruhi walking on stage in a bunny girl costume with a guitar hanging from her shoulders. Hoping to reclaim the computer Haruhi extorted from the Computer Research Society earlier in the year, the Computer Research Society President challenges the SOS Brigade to a computer game they created for the cultural festival entitled "The Day of Sagittarius III." Haruhi accepts their challenge, but soon finds out that playing the game is much harder than she thought. Haruhi starts the SOS Brigade with four members: Kyon, Yuki Nagato, Mikuru Asahina, and herself. Haruhi begins to improve the clubroom's appearance, but still feels that it is missing something — a computer. Going next door to the Computer Society's clubroom, Haruhi manages to obtain a computer through dubious means. She enlists the help of Mikuru to help promote the SOS Brigade by dressing up as a bunny girl and handing out fliers. Later, Yuki invites Kyon to her apartment, where she begins to unveil a secret about Haruhi and herself. Shooting of the SOS Brigade's short film continues. 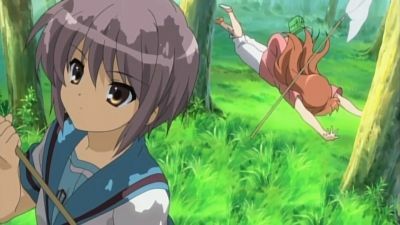 During the battle scene, Haruhi is displeased with Mikuru's acting. She yells at her, demanding that Asahina try to shoot a laser beam from her contact-lens-colored eye, but Kyon manages to cool her down . 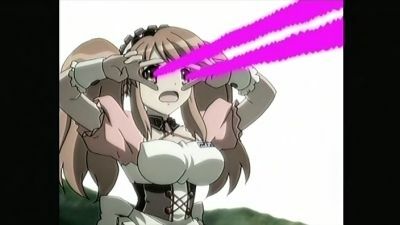 Afterwards the scene is reshot but, to the surprise of everyone except Haruhi, Mikuru actually shoots laser beams from her eye. Yuki knocks Mikuru down and apparently takes her contact lens. 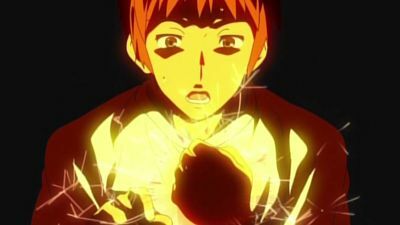 In a conversation Itsuki explains to a shocked Kyon that Haruhi changed reality once again and Nagato proves his words by showing her hand, burnt while protecting Kyon from being hit by the laser. Koizumi promises to take care of Mikuru's problem with Yuki's help. The rest of day is spent on shooting more scenes with Mikuru dressed as a bunny girl. The next day Kyon finds out that Haruhi dragged Tsuruya, Taniguchi and Kunikida to help. After Haruhi gets off to pick up Mikuru, Itsuki explains to Kyon that Yuki succesfully helped Mikuru get over herself. Haruhi returns with Mikuru, who secretely tells Kyon how Yuki helped her: she bit her to inject nanomachines into her body. 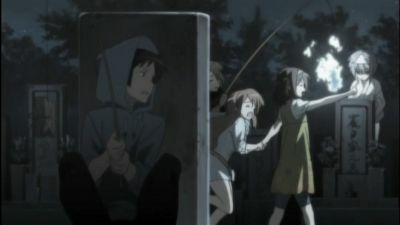 Haruhi leads everyone to the next shooting location, a lake near Koizumi's house. Haruhi and the SOS Brigade attempt to find clues to the villa owner's murder. Yutaka, the owner's younger brother, is initially suspect due to having been seen leaving the island the previous day before the storm hit. Haruhi and Kyon head outside during the storm, but find nothing. While drying off inside a cave, Haruhi comes to a startling conclusion about the murder. They return to the villa and set to devising a plan to solve the mystery. As the SOS Brigade shoot more of their film, Haruhi tries to give Mikuru another contact, ergo another superpower. Yuki quickly takes action and injects her with more nanomachines before any damage could be done. Despite the weird phenomena Haruhi's film is causing, Itsuki suggests it is better than more closed spaces being opened up. However, when Kyon discovers Haruhi arranged for Mikuru to be drugged for a kiss scene with Itsuki, he gets furious at her shabby treatment of Mikuru and almost hits her, forcing Itsuki to hold him back. This causes Haruhi to become depressed, having always thought Kyon would support her. Kyon, reluctantly learning something from Taniguchi, later apologizes to Haruhi and filming resumes. However, he seems to have inadvertently encouraged Haruhi even more, making cherry blossoms grow out of season. Kyon enters high school as a first year student and meets a strange girl by the name of Haruhi Suzumiya. During her class introduction, she states that she has no time for normal humans and asks that any time-travelers, aliens, or espers come out and join her. Interested in her, Kyon becomes the first person to solicit a normal conversation from Haruhi. This leads Haruhi to form the SOS Brigade. A "distant relative" of Itsuki's allows the SOS Brigade, along with Kyon's sister, to stay at his newly built island villa. On their first day there, they enjoy the island's facilities, but are soon drawn inside by the arrival of a storm. While waiting for the storm to pass, Haruhi and her friends play games in doors and have fun together. Later, the owner of the villa disappears, and everyone starts searching for him. Ultimately, the SOS Brigade members find him dead in his room. The skies are overcast with a high chance of rain, and Haruhi instructs Kyon to go pick up a heater. 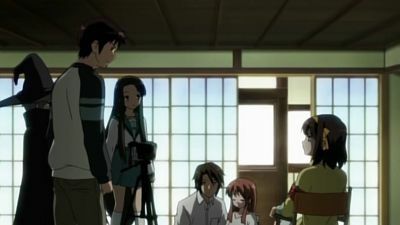 With Kyon gone, Haruhi takes pictures of Mikuru in various costumes for the movie's DVD cover, Itsuki helps how he can, and Yuki is left alone to read. After Kyon returns, he finds only Yuki in the clubroom and decides to wait for the others, but falls asleep. When he awakens, he finds Haruhi alone with him, waiting for him to wake up so they can leave. 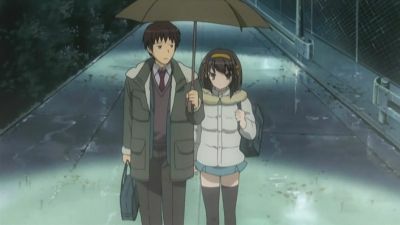 It has already started raining, so Haruhi borrows an umbrella from school for them to use. The SOS Brigade's website has been created, but it is composed of little more than the club logo. Coincidentally, the SOS Brigade gets their first case after the website goes up — they are to find the missing Computer Research Society President. Upon going to his apartment, they find that he is not there, and nothing seems too out of the ordinary on the surface. After the Brigade leaves, the members, sans Haruhi, return to the apartment where they find that Haruhi's SOS Brigade logo and a Data Entity are behind the disappearance. Preparation for the SOS Brigade's short film continues, with character roles revealed—Yuki as an evil alien, Itsuki as an esper, and Mikuru as a battle waitress from the future. 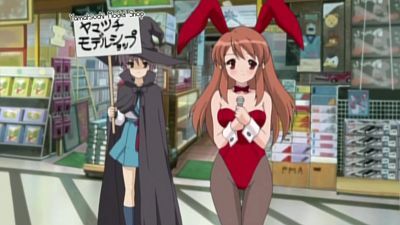 Mikuru is forced to dress in an embarrassing waitress costume for her role, while Yuki appears as a witch. On the first day of filming, the Brigade film two commercials to advertise their sponsors with Mikuru dressed in her waitress costume and then her bunny girl costume, much to her embarrassment. They then film several scenes in a park, and Kyon points out that Haruhi did not actually write a script. The SOS Brigade previews their movie of questionable quality. In the movie, Mikuru Asahina stars as a time-travelling waitress from the future who must engage in fights with Yuki Nagato, who is playing as an alien-magician. 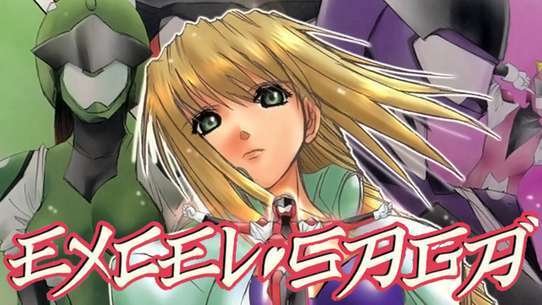 Mikuru has sworn to protect a young man, played by Itsuki Koizumi, but a love-triangle ensues with both Mikuru and Yuki vying for Itsuki's affections. Kyon is the narrator of the movie, while Haruhi Suzumiya is the director. North High School is preparing for the North High Festival. Kyon and Haruhi's class, class 1-5, decides to do some questionnaire. Haruhi does not like that decision and tells Kyon that the SOS Brigade will do something more interesting. She decides to make a movie clip that has Mikuru as the protagonist. One day, after school, Haruhi, Kyon, and Mikuru go to stores in order to get a camera and airsoft guns. 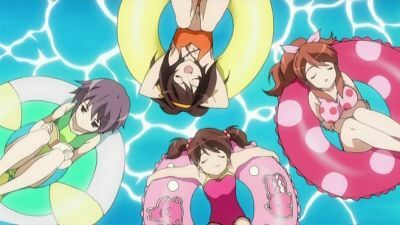 Like the previous episode, Kyon's easy going summer vacation is interrupted as the group is taken on a whirlwind tour of summer activities, from swimming pools to summer festivals, part-time jobs, and stargazing. However, Kyon is wracked by a constant sense of déjà vu. Koizumi is likewise troubled, while Nagato seems even more detached than usual. They finally work out the truth: Haruhi has put the last two weeks of August into an infinite loop because she refuses to let summer end. They find out that the loop has repeated 15498 times. However, none of them can devise anything to stop the cycle from repeating. 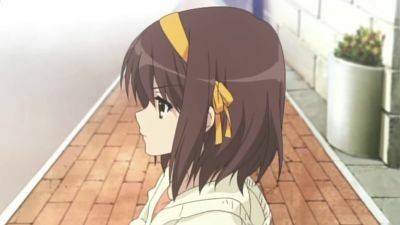 On the second-to-last day of summer, Kyon calls out after Haruhi in a last-ditch attempt to stop her from leaving unsatisfied, but fails to think of anything he can do, and she leaves. As the last day of vacation arrives, Kyon, resigned to the loop repeating itself, goes to bed without finishing his summer homework. After the busy island adventure with the SOS Brigade and a family trip to visit relatives in the countryside, Kyon is just settling in to relax for the final two weeks of summer vacation. Unfortunately for him, Haruhi wants to get everything she can out of the precious time remaining, in the company of the SOS Brigade. As such, the group is taken on a whirlwind tour of summer activities, from swimming pools to summer festivals, part-time jobs, and bug hunting. Finally, Haruhi has made it through her entire list, and the last day of August arrives. Though Kyon tries to make up for lost time by doing his neglected summer homework, he eventually gives in to distraction, going to bed just before midnight. The loop continues for the 15,532nd time. But as Haruhi leaves, Kyon knows what to do to break the endless loop of summer. The same exact events in the previous episode once again unfold with slight variations and the gang wearing different clothes. Once again the Brigade, with the exception of Haruhi, finds out that they are trapped in an infinite loop. In this 15,499th loop, Kyon and the others once again are unable to discover how to escape the endless summer. 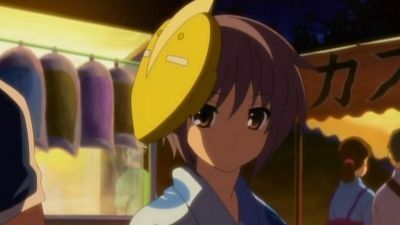 In the same scene in the restaurant, Kyon is unable to stop Haruhi from leaving, hence dooming the world to another summer loop. Kyon again goes to sleep without finishing his homework on the last day of summer. The previous time loop continues for the 15,513th time. This time, Kyon mentally senses an even greater familiarity with events and places from previous cycles. Once again, none of the Brigade members can devise anything to stop the cycle from repeating. 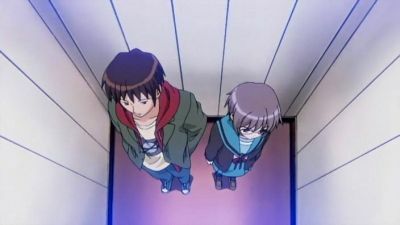 On their final meeting in the restaurant, Kyon tries to call out after Haruhi but fails to do anything as visions of the loop's events flash in his mind. As Kyon regains his senses, Haruhi has left. As the last day of vacation arrives, Kyon, resigned to the loop repeating itself, goes to bed without finishing his summer homework.